WHAT BEGAN AS JUST A ONE-MAN OPERATION located in South Bethlehem has now, 80 years later, grown into a multifaceted, full-service electrical contracting organization in the Lehigh Valley. 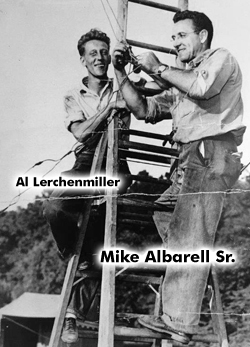 Michael L. Albarell, born and raised in Bethlehem, founded M. L. Albarell in 1937. As a Bethlehem Vo-Tech graduate, Michael taught himself the trade and after returning from World War II he restarted the business while raising a family with his wife, Agnes, who could also be found in the shop repairing lamp cords and keeping the books. In 1943, the business moved to the North Side of Bethlehem along Easton Avenue where it soon expanded its operation to include electrical motor repairs. What started as residential construction had now evolved into servicing both commercial and industrial customers. The company’s first commercial project was the Peoples Bank in South Bethlehem, which today, stands as the Social Still located on East Third Street. In 1966, Michael reached out to his son, Michael M. “Mike” Albarell. Mike had just completed a tour as a tank commander in the U.S. Army and was contemplating re-enlisting for a second tour. 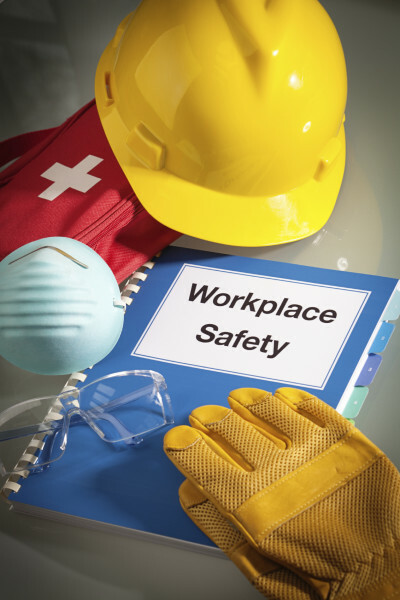 “At the time, Dad was experiencing instability with some key employees. So, I asked him ‘What do you want me to do?’ He said, ‘I’m not going to tell you what to do.’ So, I said, ‘All right then, I’m coming home,’” explained Mike Albarell, CEO. The father-son partnership continued to grow – dad with the technical expertise and son Mike with the people and team building skills that he acquired in the military. “Dad often told me ‘You don’t need to know it all, you just need to surround yourself with the right people. Even if those people are smarter than you,’” confessed Mike. That advice has served Mike well over the years. Since transitioning the leadership during the 1970s, Mike has been able to expand the business in a way that would surely make his father proud. Now employing close to 200 people, the company has extended its market presence to Pottsville and Philadelphia. A key aspect to growing any business is people. Mike prides himself on involving key employees in the business, many of whom have enjoyed very long careers. “I always thought it was my job to keep people working so that they could financially provide for themselves and their families,” said Mike in regards to his management approach, which has resulted in a very strong sense of loyalty amongst his workers. The list of customers is extensive and spans a timeframe that began in the era of Bethlehem Steel to the present day descendant of that site, the Sands Casino and Hotel. Albarell has successfully completed projects in every school district across the region, all colleges and universities of Lehigh, Lafayette, Moravian, Cedar Crest, Muhlenberg, DeSales, and both Community Colleges of Northampton and Lehigh-Carbon. They also continue to work in all three major hospitals of St. Luke’s, Lehigh Valley and Easton. Albarell did the electrical installation for the original Lehigh Valley International Airport Terminal in 1975 and the two renovations that followed. The list of commercial and industrial accounts continues to grow and includes the likes of Sam Adams and Yuengling Breweries, Coca Cola, PPL, B. Braun Medical, Nestle, Hercules and Keystone Cement Companies, Victaulic, the Lehigh Valley and Whitehall Malls; both Lehigh and Northampton County Government Centers, Courthouses and Prisons; ArtQuest, Ben Franklin Tech Ventures, the National Museum of Industrial History, PBS and the Allentown Art Museum. One of the company’s most recent endeavors, the FedEx Ground Project, is one of the largest FedEx facilities of its type in the nation, proving there is nothing Albarell can’t take on! Although the company is known for its electrical construction, Albarell’s motor repair shop is one of few in the region that provides complete rebuild and rewinding services to a customer base that stretches the entire Northeast. Albarell was also first in the region to incorporate infrared cameras as part of its preventative maintenance services. The program which started in the mid-1990’s now employs certified thermographers with Level III ANST Training. Albarell has also designed and completed some of the regions more complex telecommunication installations. The firm employs its own Registered Communications Distribution Designer (RCDD) and they continue to provide routine support services to some of the region’s mission critical operations that include PPL, PNC Bank and EMCOR Facilities Services. As for the future of the business, there are no signs of slowing down after 80 years. For some time now the company has taken steps to transition the succession of the business to a “new family of sorts.” Michael Conkey (often referred to as “Mac” to help distinguish himself from Mike Albarell) grew up in the industry and comes from a long family history of electricians. Mac now serves as the President of Albarell Electric. Hoyak, a former banker of 28 years oversees all the financial and non-operational aspects of the business. Together they make the partnership capable of carrying on the Albarell tradition. 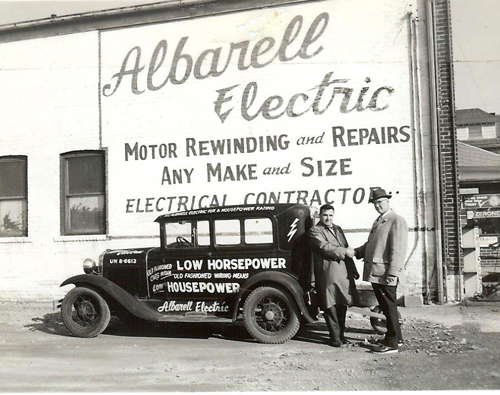 No matter what the future holds for Albarell Electric, based on their ability to prosper through decades of change, there appears to be nothing stopping the company for many more years to come. Hosted with permission from Lehigh Valley Business. Copyright © 2017. All rights reserved.